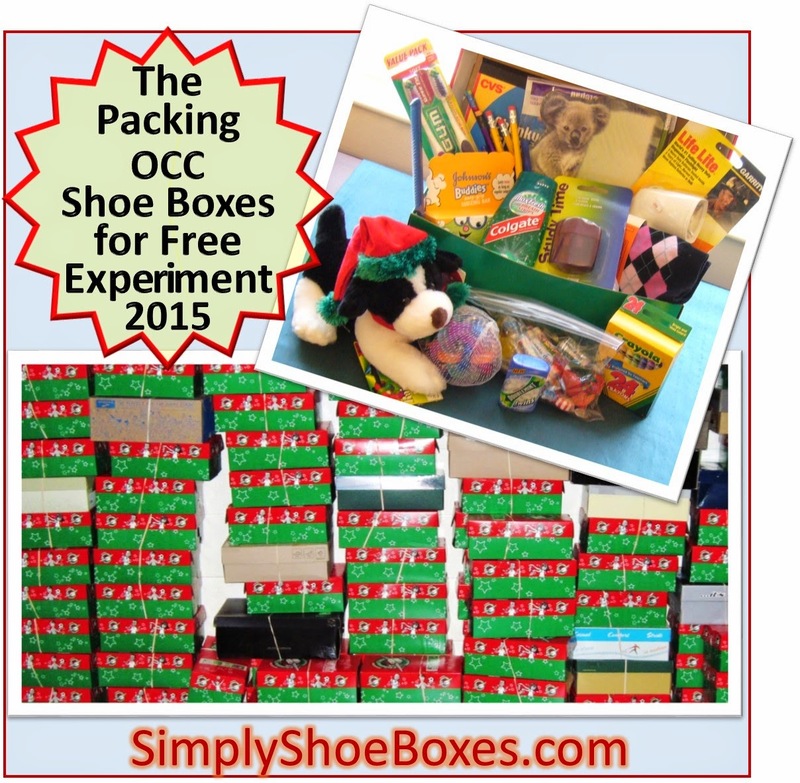 Now that my 2014 shoe boxes are packed, I have an unusual packing experiment planned for the 2015 Operation Christmas Child collection. I am going to see how many boxes I can pack and ship without spending any money from my personal budget. I think it is safe to say most everyone who packs a shoe box wishes they could pack another. Those who pack many wish they could pack many more. 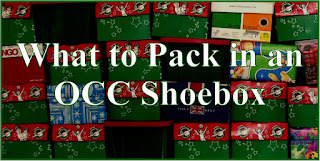 So I have decided to seek out ways to pack more and share my journey here at Simply Shoe Boxes so others may be able to take advantage of some of these and also have the opportunity to pack more boxes. hope to find more ways I can fill more boxes. Being mostly home bound and having to depend on others for running all errands makes it a little harder to find free sources. I have dozens of items left over from this year's packing. I often send these as fillers to the processing center, but this year I am going to hang onto much of it to incorporate into next year's boxes. By spending just 5 minutes a day in online activities I can easily earn $5 in CVS or Amazon gift cards each month. They offer dozens of gift card options, but these two are what I stick to. I will focus these on hygiene items and pick up items at Amazon that I am short on at the end of the packing year. If I have a more time to spend I can earn much, much more. 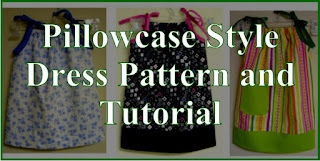 I have shared on my other blog a Swagbucks 101 Series if you are interested in learning more. From their website: "It's available in all of the following countries where Swagbucks.com has official presence. " Links in this post are my referral link. When you choose to sign up under me at Swagbucks I earn 10% of what you earn. I will use all earnings towards filling more shoe boxes. MyPoints is much like Swagbucks. I earn free gift cards I can use to buy fillers for my shoe boxes. 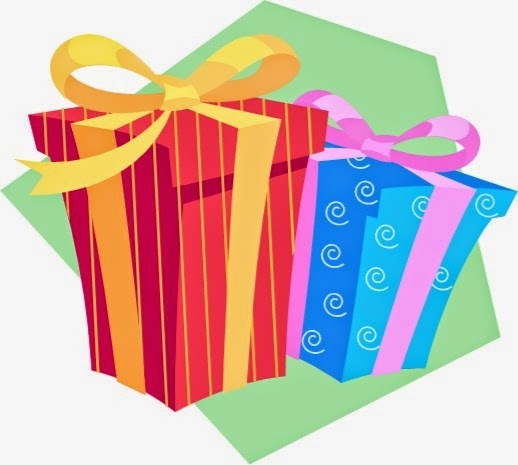 I will request birthday and Christmas gifts that I can put in my shoe boxes. 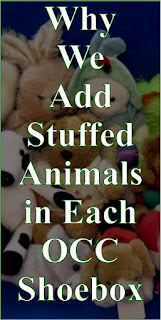 I've already put in a request for toys to go with the dresses I make for the 2 to 4 year old girls. I'm going to make a Pinterest board of Christmas wishes -- I think it will look much like a toddler's wishlist :-) . And I've added a bulk roll of elastic to my Christmas wishlist from my mom--I use this with my pillow case dresses. And hopefully win some! 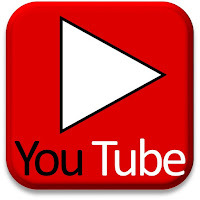 Check out my post: How To Find and Enter Blog Giveaways to learn how. I have been given a good bit of fabric for gifts, from an online sewing buddy, and inherited from my sister and mother-in-law and I still have many pieces left. I had birthday money last year and when the local craft store had closeout bias tape for just 25 cents I stocked up big time! I inherited dozens of skeins of yarn from my Mother-in-law. use clothing, cards, paper towel tubes, etc. 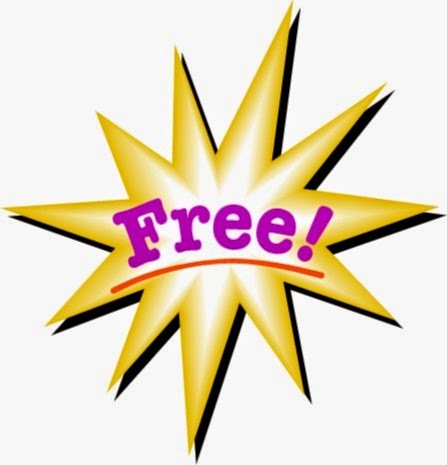 Pick up free items at fairs, etc. I wonder how many I will be able to pack? I hope to earn $5 a month above my blogging costs. This is in the form of cash so I will save it for shipping the boxes. Earning cash back for grocery shopping. SavingStar is a service that offers coupons on grocery/household items. They are attached to your store loyalty cards and when you buy the item it is deposited in your SavingStar account. When you build up $5 you can cash it out. I will use my cash back checks for shipping the boxes. My Father-in-law usually gives us cash for gifts, and I will save this towards shipping costs. This does not mean I will not be spending any money on Operation Christmas Child shoe boxes this year, it just means I am going to see how many I can pack without spending any thus increasing the number I am able to give. My goal is twofold: one -- pack more boxes and two -- help others find ways to pack more boxes. 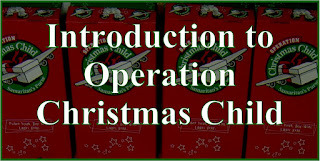 How do you find ways to stretch your Operation Christmas Child shoebox packing dollars? 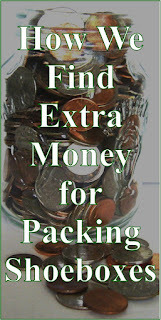 What helps you to be able to pack more boxes or do your box more inexpensively? 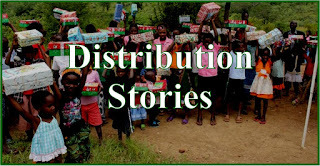 To keep up with our shoebox stockpiling you can check our additions each Saturday when Sarah posts them. 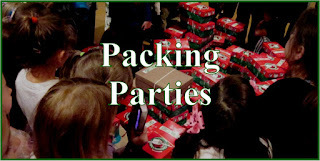 You can see them all here: Shoebox Stockpile Saturday ~ Adding to Our Operation Christmas Child Shoebox Stockpile. 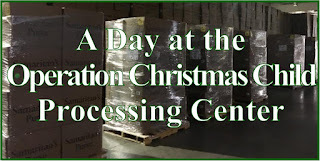 EDITING TO UPDATE 10/2015: We were able to pack and ship 50 boxes for free this year with some goodies left for next year as well as sending fillers to the OCC processing center. We will continue with this experiment in 2016. If you sign up for e-mails from Dollar General, they often send out coupons to use on Saturdays- usually $5 off a $25 purchase. I shop there anyway for household supplies & will go on Sat. 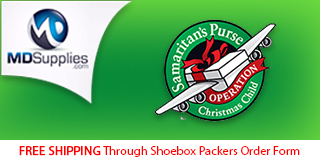 to get laundry detergent & paper goods for the house, then use my $5 off to get $5 of free stuff for shoeboxes. I used several of them this year. I like FREE stuff for shoeboxes! Great idea, Carla! Thanks. We moved a couple of years ago and there is a Dollar General just a mile away so we shop there often, too -- love their clearance items for shoe boxes, too. Have you hear of mypoints. It's another points program. THey send a few e-mails a day and if you click on the links you get 5 points. About once a year I have enough points to redeem for a $25 gift card. If you would be interested in joining I could send you a referral e-mail and then I will get a few points each time you earn some. I also do swagbucks and use my amazon gift cards for items for shoeboxes as well. I live close to Menards and like to buy free after rebate items there. THey have lots of great things for the older boys shoeboxes. This sounds like a fun challenge and is definitely something I would like to try! Thanks, Lori. yes, I used to do MyPoints years ago but I was getting so many emails that did not offer points that the time was getting too much for me to check them all. 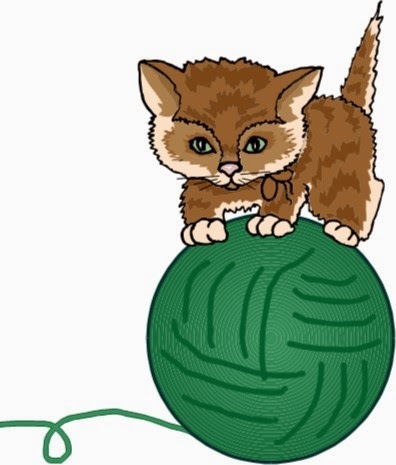 I decided it was easier for me to do Swagbucks only, but maybe I should try it again this year. Maybe some other readers would like a referral. Leave a comment if you do. They've changed the format at the top of the e-mail so it tells you at the top whether it is worth 5 points or not. Makes it much faster to go through and delete the ones that aren't worth it. Ah, that sounds much more promising. I think I will start looking at them again and see if I can earn a little something. Thanks a lot. Lori, I just went thru all my old emails -- well, until I started hitting expired ones -- and I got 50 points. I have about 1400 points from before so hopefully I can get something for sure. What else do you do on MyPoints. I used to do some little simple survey questions that were right on the homepage, but they are gone. Not sure what else to do. I use my bank card as credit instead of debit and I get points. Gift cards can be purchased with the points, or they can be turned into cash and added back to your checking account. I also have a lot of Bing points that I can redeem for gift cards. I will be on the lookout for free items through merchants, banks, etc. I got a lot of nice free stuff this year, including coloring books, pens and pencils, note pads, erasers, 6 inch rulers, and other items. Wow, that is a great list of freebies from last year -- I would love to put 6" rulers in all of my boxes. I have heard of Bing but haven't pursued it, thanks for that reminder. Nice on the bank card rebate. Happy Packing & thanks for sharing with us. I have been out hitting Christmas clearances 75-90% off, using CVS bucks/Kohl's cash/store deals. I have been inspired by your challenge. 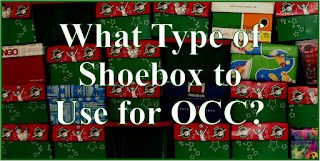 I am truly looking forward to using what I have on hand to craft some shoebox joy! 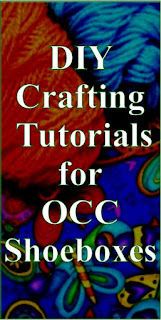 I have always meant to craft but never pulled it off. I am finally gonna be organized w/bins & tally sheets & deals/steals follow-thru. I feel brave enough to ask my Dentist if he'd wanna partner w/me in prayer & donating dental hygiene kits to my boxes! Way to go, Denise! 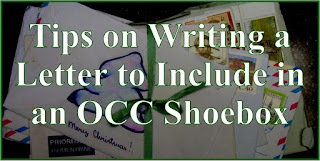 Thanks for sharing your shoe box plans with me -- I love to read what others are doing. 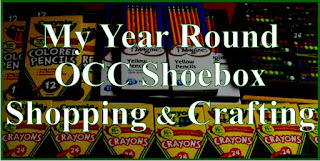 Sounds like you will have a productive shoe box packing year! Keep in touch and give me updates now and again. I am planning to save my Walmart Savings Catcher e-Gift cards to use on shoebox items this year. We waited till last minute - the day before our church was collecting - and then filled one shoebox for a boy each of my 4 boys' ages. We hope to do more this year . . . and cheaper. Great idea, Nikki! It is fun to collect all year as clearance deals come along and Walmart is a great place to find them from I have seen on Clip with Purpose--our Walmart is difficult to get to so we rarely get in on any. Happy packing! Let me know next year how many you end up with. To pay for shipping, I quit ordering drinks like tea or soda when we are out for meals, and put the $2 in a jar when I get home. I also clean out the change that I drop in the bottom of my purse for the jar. It is adding up quickly and I don't miss it at all. Fantastic, Cathy! It's amazing how little sacrifices can make such a huge difference.